Assumption of the Blessed Virgin Mary Church is located in central PA, approximately 1 hour north of Harrisburg and one hour south of Wilkes-Barre. Take Frackville exit 124A to route 61 south. Travel 3 miles. At the 2nd traffic light (Hancock St) turn left. Continue straight for 5 blocks and turn right on Nicholas St. Go 2 blocks; the Church is on the left. 10:30 AM Divine Liturgy or Obednitsa. 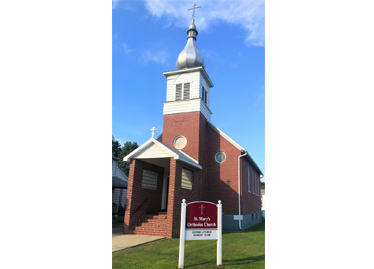 The parish was organized by a group of thirteen immigrant families from the village of Kamyanna of the Sandetsky district of Galicia. Their first services were held in a Lutheran Chapel which they rented for $25 a month. Fr. Miron Wolkay commuted from Sheppton, PA and Fr. Elias Klapotovsky from Old Forge and Fr. Alexander Nemolovsky from Reading also provided services. In 1901 1 1/2 acres of land was purchased in Arnot’s Addition for a cemetery. The Most Reverend Tikhon, Archbishop of North America and Aleutians blessed and dedicated the cemetery. (later St. Tikhon, Patriarch of Moscow, Enlightener of North America). The parish house and adjoining ground were bought in 1906 for the purpose of building a Church. Auksenty Chylack was architect of the Church with the help of Eugene Gogetz. The icons for the screen were prepared and written by Joseph Warchol. A parish book from 1915 shows that 123 persons were in the parish. The Church Choir, Balalaika Orchestra, Dramatic Club, Brotherhoods and Women’­s Altar Society were organized. On January 14, 1939, during the Vesper service, the Church caught fire. Repairs were made with the help of insurance money. Maintenance and improvements to the Church, church hall, parish house and cemetery have been made through the years with the aid of the parish organizations. Over the years many dedicated clergy have served the parish.